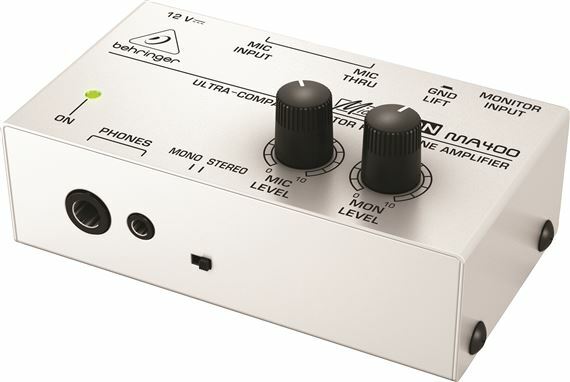 Small enough to fit in your pocket with an affordable pricce, Behringer MA400 is the ideal personal monitor mixer for the performer who always asks for "more me." 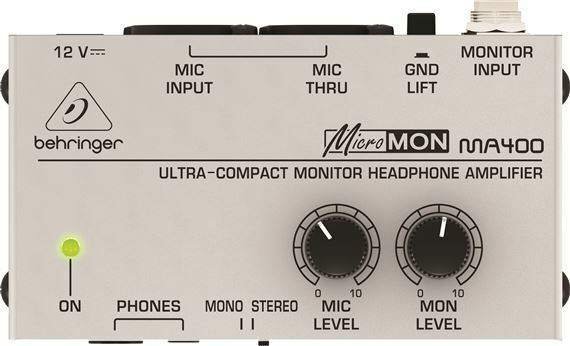 The ultra-compact Micromon MA400 is the ideal personal monitor mixer for the performer who always asks for "more me." Small enough to fit in your pocket with a price that everyone can afford. The MA400 features XLR THRU jacks and provides superb noise-free operation. Just connect your mic to the MIC INPUT and send a line from the MIC THRU to your main mixer. 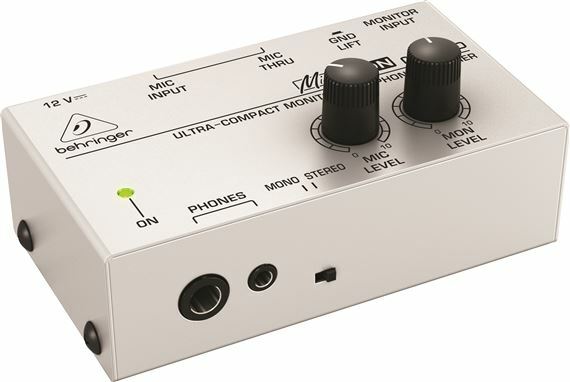 You can even use studio-grade condenser mics, as the MA400 will pass +48 V phantom power, if your mixer is so equipped. The PHONES jacks accept both 1/4 in. and 1/8 in. headphone and earbud connections, making the MA400 ideal for hardwired IEM (in-ear-monitor) applications, such as singing drummers and keyboardists. The MA400 comes with a 12 V DC power supply and an LED to indicate when it is powered up. I always read product reviews before purchasing online, and the reviews I read all praised the amp and condemnrd the headphones that come in the package. The phones were changed but not improved. I HIGHLY RECOMMEND NOT GETTING THE PACKAGE AS THE HEADPHONES ARE STILL GARBAGE--AT ANY PRICE. It's a little small to be feasible. When you have you have 2 mic cables, a speaker cable, a power cable, and headphone cable coming into and out of a small box. the wires out weigh and dominate the space. other than that, it out-preforms all of the rest, when connected to a powered source, like you would be doing if you were trying to replace floor or near field monitors. If you are playing in a fixed position, like a drum set or keyboard. why pay for a "wireless" system. this works great. you can here more of your voice or instrument,without messing up the mix, or just turn up the monitor or down so you can hear.